As usual, whenever we get any new android phone, we try rooting the device after unboxing. Not because it’s fun rooting (It’s actually fun experimenting though) but because we would want to be sure of our tutorials before publishing them on this blog. Few days back, we unboxing the infinix zero 2 x509 android phone and also gave a comprehensive hands-on review of the device. We have been able to root the phone easily and also change the font on the device and it’s time we share the tutorial with you. To be candid, rooting the phone was very easy. It took less than 5 minutes to root. The time it actually took to root completely is as a result of my internet connectivity so i guess i will give some credit to my internet speed as at that time. Without wasting much time, let’s cut to the chase. We will be aiding you with screenshots as we proceed. That way, you shouldn’t have any troubles or difficulty in rooting your own Zero 2 X509 android phone. ==> First, you will need to download the latest version of Kingroot apk app which is the version 4.1.0.249. We wouldn’t want to stress you by asking you to go source for it hence, we have made it available for download HERE. ==> Install the downloaded app. In the course of installing, you may encounter a warning, don’t panic, ignore and choose to continue. ==> After installation, launch the app and allow it to examine your phone. You should get the message ‘root access is unavailable’. 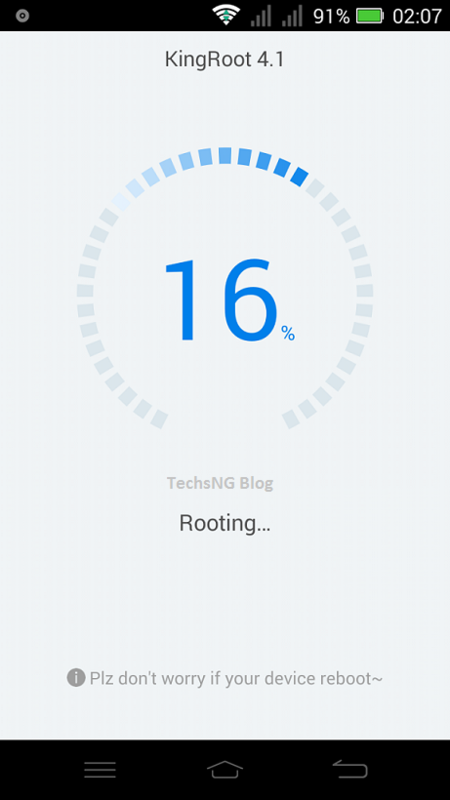 ==> Tap On TRY TO ROOT and the rooting process should commence. Please make sure you have an active network connection before tapping the try to root option. ==> In the course of rooting, the device will restart. Don’t worry, you are safe. When the device restarts, don’t press anything. Just leave the device and the rooting process will automatically continue. ==> Depending on your network speed, the process may take within 2 to 4 mins. Along the line, you may get a message asking you if you’d like to install KingUser, choose to install and wait till you get the notification stating ‘Root Successfully‘. ==> At this point, you can just choose to close the app. 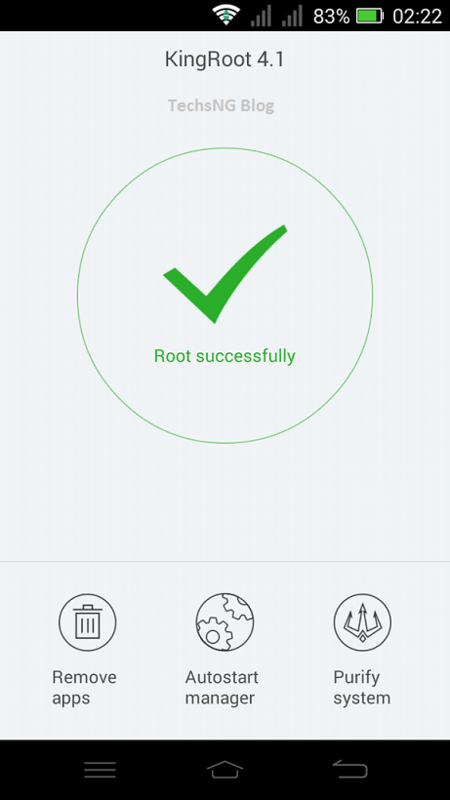 Your Infinix Zero 2 X509 android phone has been successfully rooted. There are basically three ways to which you can check if the root was truly successful. You can relaunch the already closed Kingroot app, allow it to examine your device and this time, you should get the message ‘Root Successfully‘. 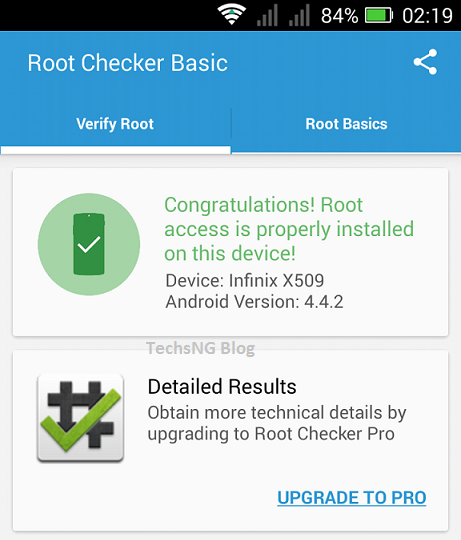 Alternatively, you can choose to install Root Checker Basic App from Google Playstore. 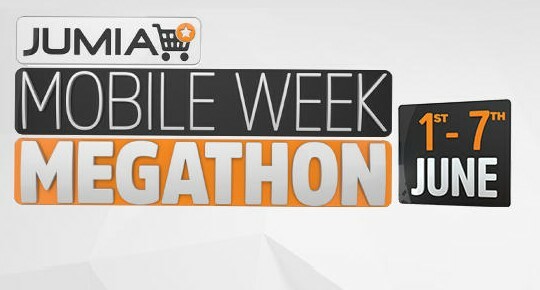 Launch the app and let it examine your device, you should get the message ‘Congratulations! Root access is properly installed on this device!’. So, there you have it! Rooting the device is very much easy. Now, how about changing the default font on the infinix zero 2 x509 android phone and perhaps, changing the IMEI number on the phone in other to use glo bis plan on it? Very easy too! I Will be writing on those in subsequent posts. If you’d like to customize texts and figures on your infinix zero 2 x509 android phone, watch out for the post where i will be writing on how to change fonts on the device. 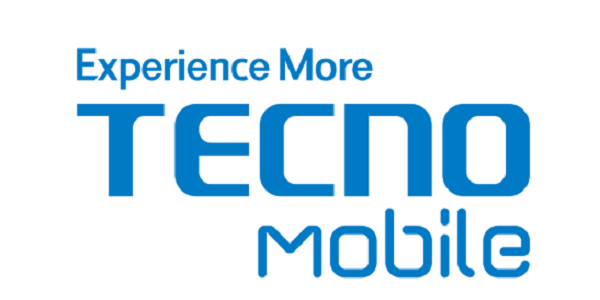 please I have root my tecno y6,after some months I do factory resetting ..after the resetting my phone starting behavior I can’t even received calls ..plz help me..
Update the software how Sam? Alex, simply update the phone’s software and that should fix the issue you are facing. Lawrence, kingroot needs ‘stable’ data in other to successfully root an android phone. Anonymous, have you tried doing a hard reset? Hi Samuel,thanks for assistance,I transfered music to my infinix hot 2 from a computer,they play Bt after sometimes they failed to play at the playlist the response am getting is “couldn’t play the track you requested” Bt in the file manager it plays well,how can I make then to play? After rooting my infinix zero 2 with kingroot apk how will I able to used my glo bis on it Pls samuel…. Desmond, change the IMEI to a blackberry imei and you are good to go. Hi samuel. Thanks for all your help. Got an infinix zero phone and decided to do an update with the glo bis. I think the update screwed up the OS. It was stuck on “Optimizing app 1 of 128” for hours until i rebooted into recovery. Tried cache delete and factory reset. Then i got “Optimizing app 1 of 56”. So, you are unable to boot the phone to it’s proper start up screen? No Bro.. I got zero 2 lollipop version yesterday at launch with 3gb ram n 4G LTE..
hi bro.. can i use that kingroot method for rooting my infinix zero 2 lollipop ? Martin, Infinix zero 2 ‘lollipop’? 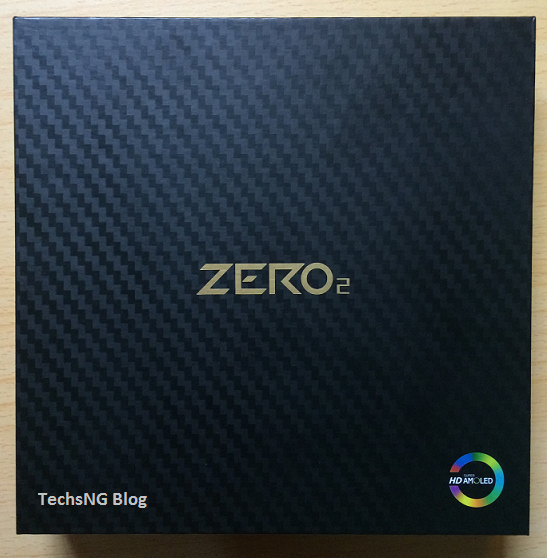 An official lollipop OS for infinix zero 2 hasn’t been launched yet. Except for public betas. Hello. I tried rooting my infinix x509 using kingroot and now my phone is stuck in a boot loop. It shows the infinix logo, goes off and comes back on to show the infinix logo, over and over. Please what do I do? Hello Muyiwa, Rooting the phone using the kingroot app as explained in the post won’t brick your phone. Tell me exactly how the phone got bricked (the exact truth) and maybe I’d be able to help. 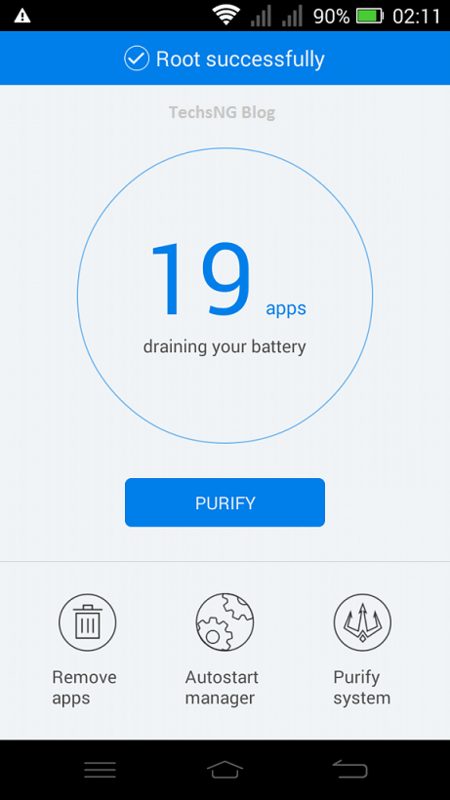 After rooting my device can I uninstall the kingroot app? Yes Richard. However, it’s best you don’t delete it. 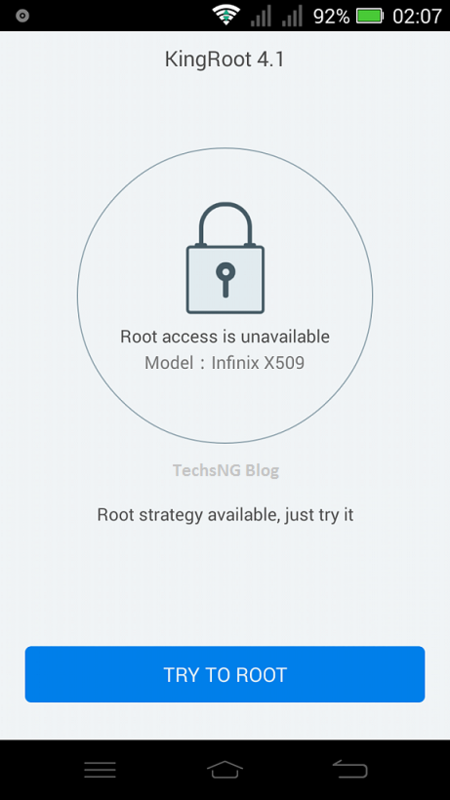 bro….pls help me, i rooted the infinix x509, with kingo root nd it was successful, until i upgraded d software nd d root was gone, nd since den each i root it, it wud be successful, bt wen i put the fone off and on, d root wud be gone, pls help wat do i do??? Ooophs! That’s a new one. What app do you use in verifying root access? bro…i rooted it wit kingo root nd its was successful, den latr its showed dat dea was a upgrade for its software, so i upgraded nd d root was gone, nd i av been trying to root it ever since bt each tym it roots, nd i put it off nd on , nd i check it root status, d rooting wud be gone…dis is for infinix x509, wat do i do ? Is the device still useful or it has been bricked? If bricked, i would taking the device to a carlcare center as carlcare supports infinix phones. i tried upgrading my infinix hot note software and alongline it showed ‘error’ then it showed ‘no command’.. After that I’ve been trying to bypass the ‘no command’ but its not going .. Pls what should i do.. Can it still work? Ben, did you unroot the android phone before upgrading the software? Yes it is an english version and it can root your infinix 551. Just follow the instructions squarely.